Members of the Rotary Club of Sunyani Central, Ghana, with the District cloth. In Ghana, the public’s understanding of Rotary is still not where we would like it, especially as most projects take place in communities with little or no formal education, away from the larger cities where potential members would see what we do. Other misconceptions get in the way of people appreciating our cause or joining us. Because of this, it is imperative that we work hard to promote Rotary’s brand in our communities, and that we do so in innovative ways. 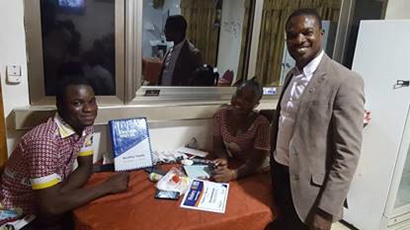 Several months ago, I visited the Rotary Club of Techiman in the Brong Ahafo region of Ghana. They hold their meetings at the ENCOM Hotel. I noticed something significant and nice. Every year, our district designs a new cloth with that year’s theme logo and logos of our partner clubs. And the hotel’s waiters and waitresses were wearing our cloth on the Wednesdays that the club meets. Visitors see the cloth and are curious, asking about Rotary. It has helped the club get new visitors who sometimes end up becoming members. This is one innovative idea to get Rotary’s brand out there, and to advertise the good work we do in the world. What are your ideas? Share them with us and learn more about promoting Rotary’s story in the Brand Center.